It's Monday and I'm up early! I'm sitting here at the dining area for hours now...well I've been sitting here staring at my screen since 5AM. Can you believe that? Anyway IT Guy casually asked me this morning on the progress of the wedding preparations. Well...not much progress. I feel so awful for it. Anyway everything is as planned. It will be a sunrise wedding, preferably in the garden and if we get to book that place we've been wanting (but we have not had the chance to visit yet, Noverie I really need to contact Emily soon!) well it will be a garden/beach wedding at sunrise. Only few people will be invited to the ceremony as we have agreed to make it very private and solemn. After which we plan to have a champagne brunch. In the evening we plan to host dinner for friends...so that will be a large crowd. Initially the dinner will be at the mountain top overlooking the entire city and will end the night with fireworks and all. So that's the plan. The details are to follow. That is because I have not taken time to work on the details yet. Anyway we still have like a year or so...so I thought. But somehow I felt bad when he asked me and I have nothing new to tell him. Well just a few weeks ago I saw a nice save the date stuff...and he loved it. But...after that...nothing. 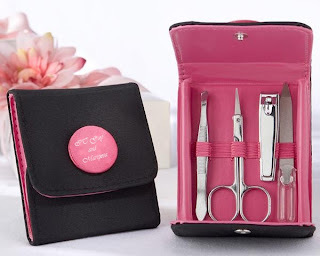 So I did a quick research this morning and saw some very nice wedding favors online. Oh my how I love them! It's done...this will be my gifts for my entourage...I mean for my bridesmaids! Hopefully they'll love it. For my wedding favors three cute items stand out...and well I plan to get all of it! 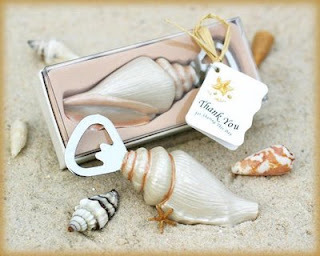 Then found this bottle shell bottle opener...which I think male guests would love to have! Very cool...party favors and seat card holder all in one! I LOVE them all. Okay...let me call the IT Guy so he can check this post. My Fun Monday will be posted later. 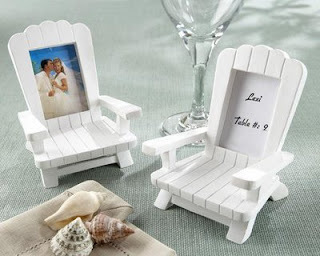 These are great gifts for the wedding. I love it! :-) I'm so excited now.